Being a customer focused organization, we are engaged in manufacturing, supplying and exporting high grade Under & Over Voltage Relay. Our professionals make personal interaction with patrons, to get the clear view of their required specifications and provide them with these voltage relays, accordingly. In addition to this, our professionals make use of only best quality raw material in the manufacturing process of these voltage relays and keep in mind the established quality standards. To solve the problem of over and under voltage, we are engaged in offering microprocessor based Under & Over Voltage Relay. Our offered voltage relay is based on latest technology and fitted in 96 mm X 96 mm sq. enclosure. If electrical products are connected with load that is more than the settable limits of voltage, this voltage relay indicates the power cut with alarm. This voltage relay is based on the principle of precise sensing of actual voltage and w.r.to pre-set levels of permissible over & under voltage. 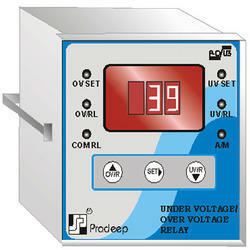 Offered voltage relay activate protection circuit when the voltage crosses pre-set limit. Further, inform about this by activating alarm and indicating using LED. Prior to delivery, offered voltage relay is checked under in electrically energized conditions for duration of 48 hours for ensuring the reliable performance and perfect design.